As the cold weather begins to set in here in Perth and we stare longingly at the heating thermostat wondering whether it's a bit too early to turn it on, we're also wondering what kind of lollies we'd use for a winter wonderland theme for our lolly carts...not because anyone has asked for one, but just because! White and light blues are the obvious choice of colours for the lollies but they can be pretty hard to work with when you are looking for impact. Plus, trust us when we say that marshmallows are a nightmare to setup with as the powdery coating gets over everything and makes all of the glass jars look like they haven't been cleaned! The use of the sequinned cloth and silver plates is a really effective way of introducing a large canvass of colour with which to offset the white lollies and we simply love the simple but elegant spiral trees in the background. 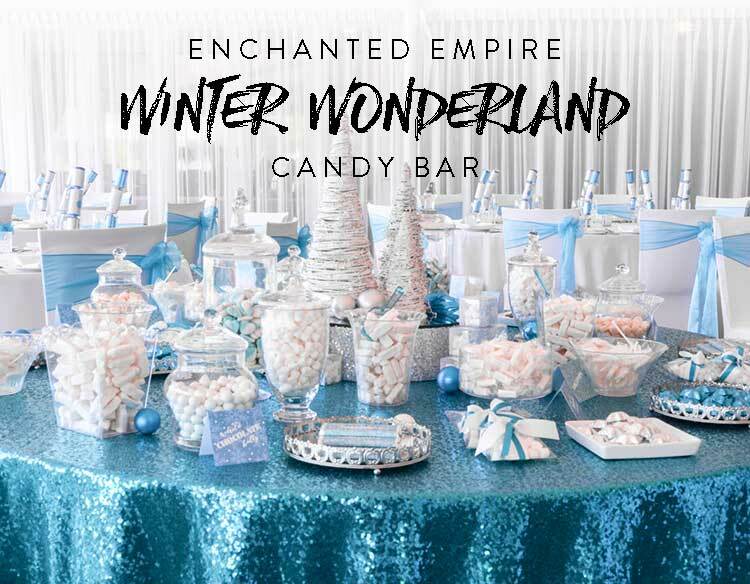 Something based on this would work well on our lolly cart, although we'd probably look at adding some icicle-effect lighting with a silver lace covered blue cloth giving we also have the benefit of a frame and canopy to work with. Perhaps its time to get creative for a promo photoshoot..?! Don't forget, you can come and visit us at the Love & Marriage Expo at the Joondalup Resort on Sunday 22 July 2018!